Nothing says the holidays like an Ugly Christmas Sweater! Festive red sweater features a Christmas tree design and multi-colored lights. Hidden 3-way switch with options for lights, blinking lights, and off! 100% Polyester. Unisex design looks great on both men and women! Great for ugly sweater parties, holiday photos, parades, and more! Nothing says the holidays like an Ugly Christmas Sweater! 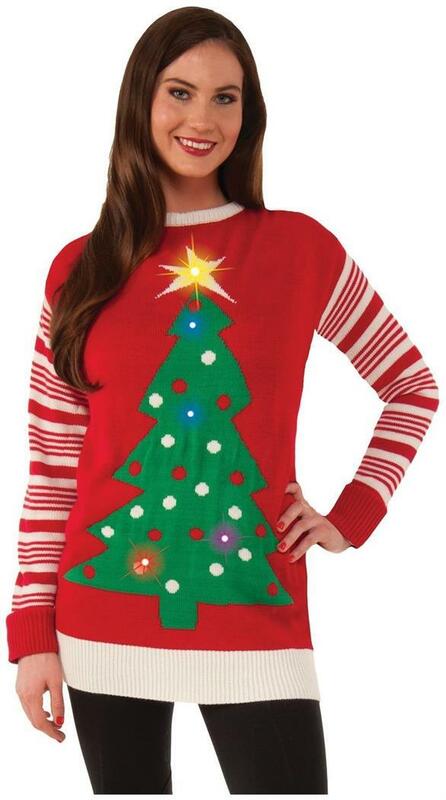 Festive red sweater with Christmas tree design and multi-colored lights. Hidden 3-way switch with options for lights, blinking lights, and off! Unisex design looks great on both men and women! Great for ugly sweater parties, holiday photos, parades, and more!